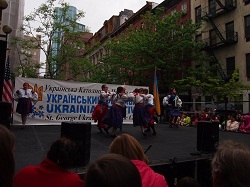 As a young student of Ukrainian folk dance on the east coast of the United States, you grow up with one dream: to someday dance at the Saint George's Ukrainian Festival in New York City. The event, sometimes called 7th Street (for the street the church sits on), is a weekend long event held the second to last weekend in May. 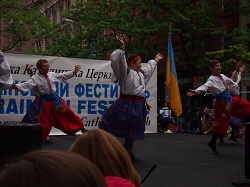 Dance groups from across the tri-state area perform, including the professional dance group that calls NYC home, Syzokryli. 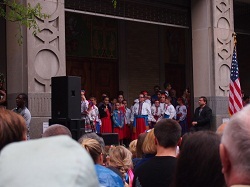 Musical acts from both the United States and Ukraine also perform. Heavenly varenyky (pierogies to some) made by volunteers from the church are available to eat all weekend. Vendors sell various Ukrainian products, from traditional necklaces called gerdany, to beautiful embroidered shirts, to the latest CD releases from Ukraine and across the international Ukrainian community. It is the biggest festival in the NY metropolitan area, attended by thousands. It is an exciting event, and a goal that many work towards the entire year. 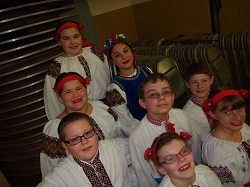 This year, our oldest group of Assumption Catholic dancers were invited to attend, and realized that dream of dancing on one of the most famous festival stages in the Ukrainian community. Dancers (and their entourages of moms, dads, and siblings) arrived early, some taking mass transit, others choosing to brave NYC traffic and parking. As students assembled, girls got their hair braided (a must! 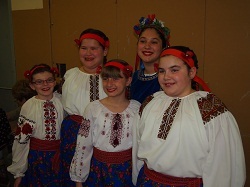 ), makeup applied, and then one final run through with their teacher, Yarko Dobriansky. Then it was time to get into costume, pose for a few pictures, and then wait excitedly for the performance to begin. 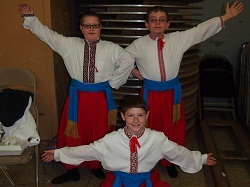 There was some snacking on great Ukrainian food, while others chose to wait until after the performance. At the start of the show, Pan Yarko, as some of the students call him, led the group to the very front of the audience area to wait and watch the other dance groups ahead of them. Some of the students were nervous, some were excited; some were both. This was it! Finally, they were led onto the waiting area, and they got to watch the group ahead of them from a perspective that few get to see – from the "wings" of the stage. The stage is set up outside, with the waiting area actually the front steps of Saint George's Ukrainian Catholic Church itself. Finally – it was their turn. The students took to the stage and gave it their all. With arms outstretched and smiles on their faces, the children danced for the hundreds of spectators standing in the streets. They concluded their dance to thunderous applause and wild screams of encouragement from the crowd, which included not just supportive moms and dads, but parishoners, friends, and absolute strangers. They were a hit. Afterwards they headed back to the school cafeteria where they had spent all morning, a crowded busy hall filled to the brim with other dance groups. They could finally relax, change back into their regular clothes (more than a few showed ACS pride and wore their class shirts or gym shirts), enjoyed the festival for a bit more, and headed home. It is a dream that is dreamed by many, but only realized by a few, and this year, our oldest dance group, Richka, got to enjoy this very special day.